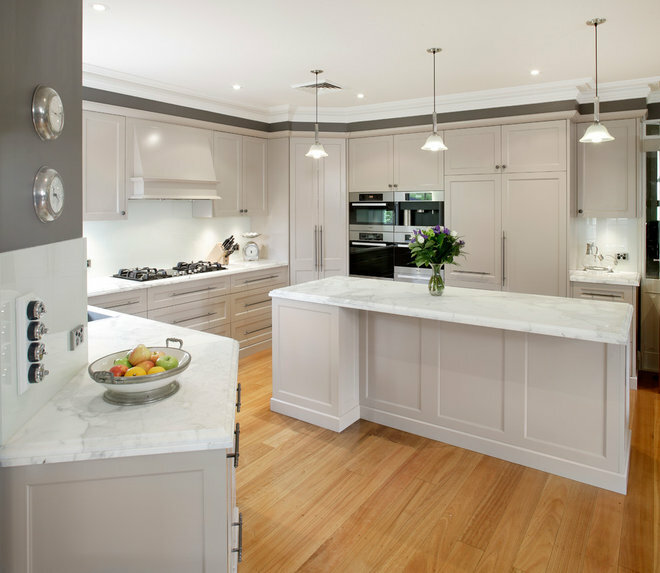 Whether you’re working with a professional or tackling the process on your own, designing a kitchen can involve a lot of decisions. Kitchen corners are one area where it’s easy to get stuck. You may want to save money with a standard cabinet. You may want swinging pullouts to eliminate bending and reaching. Or you may not have the space for either option. If you’re struggling to make up your mind or are unsure of where to start, don’t stress. 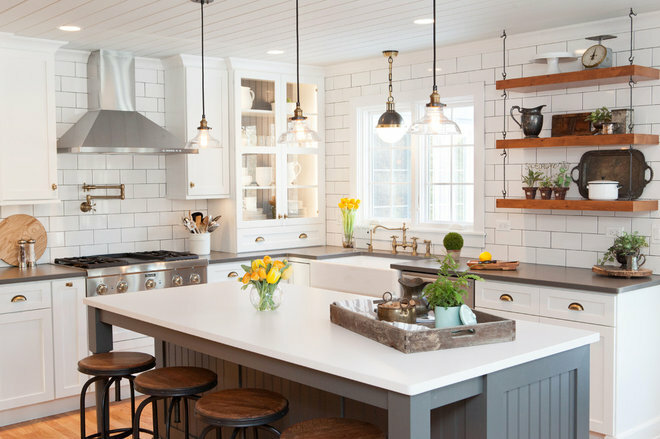 These 13 solutions will help you pick out the most efficient and functional option for your kitchen. 1. Blind corner. 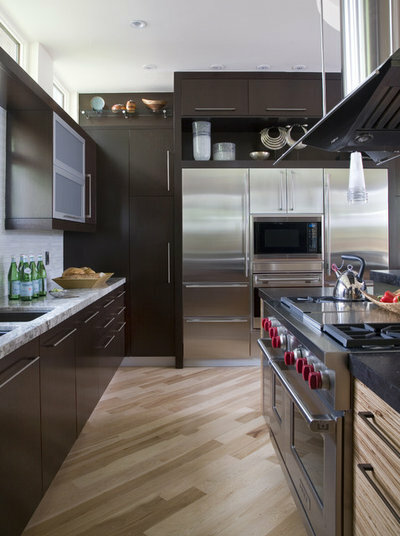 Considered a standard solution for kitchen corners, a blind cabinet allows homeowners to access the void created when two walls of cabinetry meet at a corner. This space is accessible via a single cabinet door. The downside, of course, is that while you may be able to access this space, it isn’t always easy to do it. You often have to get down on your hands and knees and reach into the back of your cabinet to find what you need. Because of this, these spaces often become junk bins that are left untouched for years. If you’re on a tight budget, blind corners can knock a few numbers off your bill. They’re less expensive than customized corner options like Lazy Susans and swinging pullouts. 2. Lazy Susan. This classic storage solution lets you place dishes, strainers, pots and pans on turnstiles and access them with a twirl of the finger. It doesn’t completely eliminate bending and reaching, but it does make the space easier to access and, as a result, more functional. The biggest drawback is that storage space can get tight. 3. Drawers. 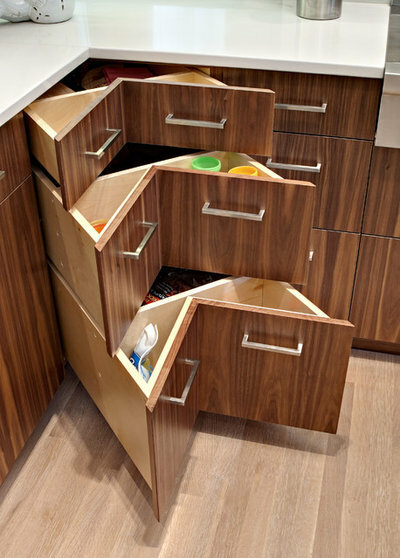 Two, three- and even four-drawer corner cabinets offer quick access to your stored items, along with plenty of storage space (especially in pieces that have deep drawers). Their accordion-like appearance can also add an interesting dynamic to your cabinetry’s aesthetics. 4. Swinging pullouts. 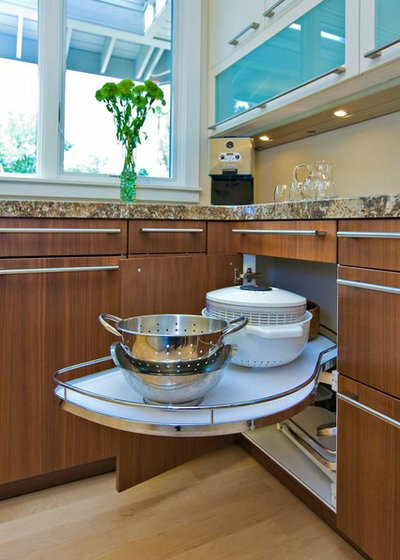 Another way to store bulky pots and pans, swinging pullouts outperform Lazy Susans by bringing your cooking utensils out of your cabinet and right in front of you, significantly reducing the amount of bending and reaching. Your storage space is limited, but the accessibility and convenience may be well worth the sacrifice. These are considered upgrades and cost more than a standard blind cabinet. 5. Diagonal cabinet. These can be prefabricated boxes or custom-built. You can even insert a standard cabinet box at a 45-degree angle if there isn’t a prefabricated cabinet available. 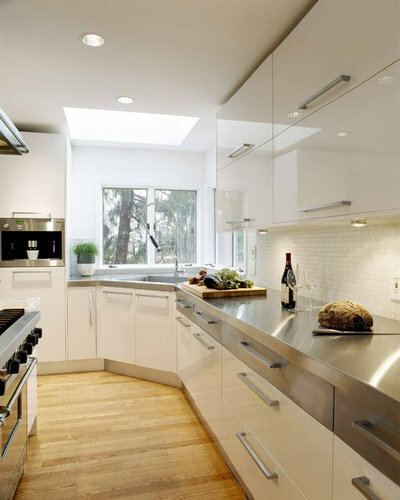 Diagonal corner cabinets are a nice visual break and can add dimension to your kitchen. 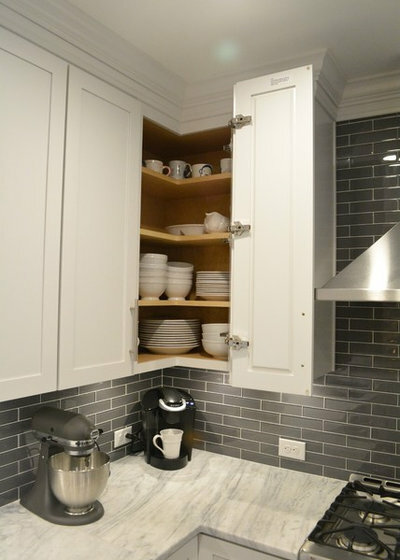 They often utilize the entire corner space, but as with blind corner cabinets, you will have to reach back into the recesses of the cabinet to find your dishware. 6. Sink base. It may not maximize space, but a corner sink base just might be worth it if there’s a view involved. The extra counter space behind your sink can house your finest decor (and show it off to the neighbors, too). 7. Dead space. Maximizing space is always preferred to wasting space. 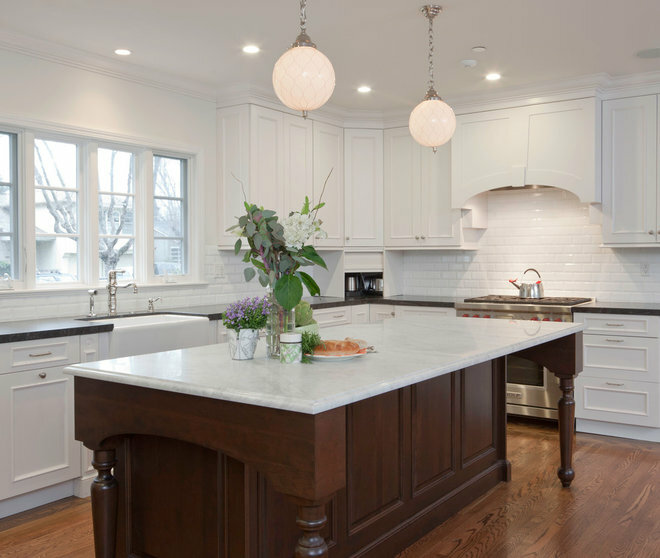 However, leaving dead space may be the best option for your kitchen, especially if you’re renovating an older home with a dysfunctional layout. 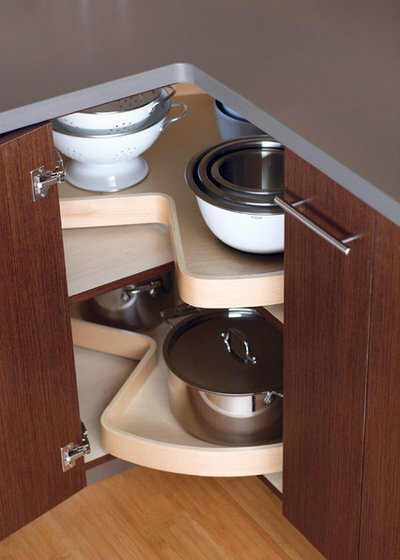 Sometimes you won’t be able to fit in a prefabricated corner cabinet. Dead space can also be your best bet if you’re trying to save money on your cabinets or are flipping a low-value home. 8. Sitting area. If you’re willing to give up some storage and counter space, a built-in banquette is a creative way to make your cabinetry feel cozy and inviting, as well as add seating space. 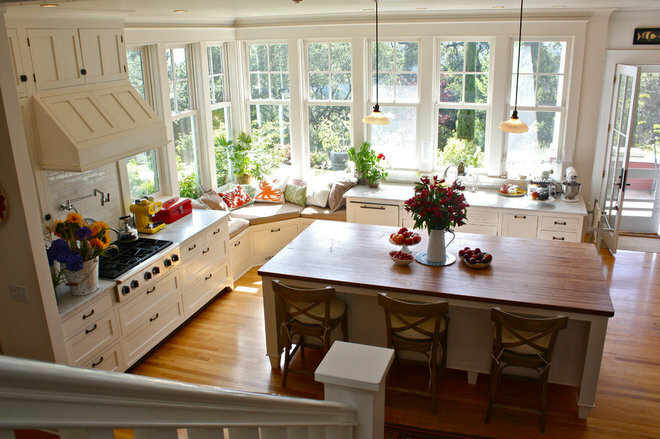 Your cushions, pillows and linens can complement your kitchen’s decorative scheme. 9. Built-in pantry. If you want to keep your cooking ingredients within reach, you can insert a custom-built corner pantry into your kitchen design. This transitional kitchen has a pantry placed at an equal distance between the range and sink, which can speed up food prep time for some homeowners. The major sacrifices here are counter space and affordability. 10. Standard cabinet. You don’t always have to install a corner cabinet. Sometimes you won’t have the space to fit one in (as in the kitchen above). Or you may simply want an open cabinet design. This is where a standard cabinet can be the best choice for your layout and needs. It won’t present any accessibility problems, though some homeowners may miss the extra storage space that corner cabinets provide. 11. Appliance garage. Storing a blender, mixer and toaster on your counter can be an unpleasant sight. At the same time, these appliances can be heavier than other types of cookware, so storing them below your counter can be a pain for your back. Appliance garages solve both of these problems. You can hide appliances behind a lift door and slide them out when you’re ready to whip up dinner. You’ll give up counter space, but it will help keep your remaining space clutter-free. 12. Easy-reach cabinet. These have a double door front that opens like an accordion, displaying both sides of your cupboard at once. They take full advantage of available corner space. You won’t have to dig deep into a blind cabinet while you’re standing on a step stool. 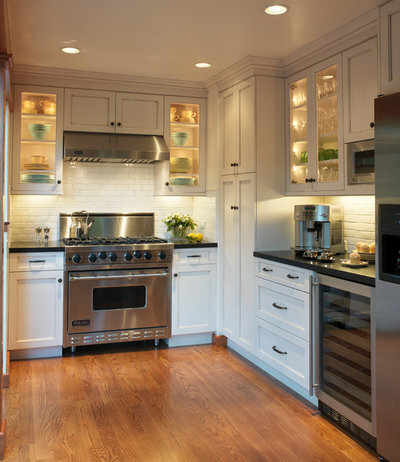 Naturally, easy-reach cabinets are more expensive than standard blind cabinets. Make sure you budget for this type of upgrade. 13. Open shelving. Wrapping shelves around your wall corner will give you access to the entire space and cut costs in the process. 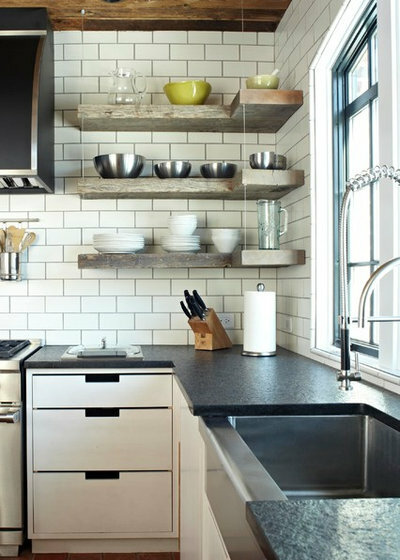 Open shelving is also a minimalist feature that works well in modern, contemporary, industrial and farmhouse designs. The major con is that it’s extra work to keep the shelves clean and organized.